Peter Byrne has led the life most of us can only dream about. After WW II he returned to Ireland, but being restless, he decided to find a job that would take him to exotic lands. Using his family's connections, he was hired as a manager on a huge Indian tea plantation in the Himalayan foothills--a posh job that came with 17 servants and a mansion. Almost immediately on arrival he was plunged into Indian jungle hunting, his primary love, when the local villagers turned to him with a plea to eliminate a rogue boar. Read his exciting description of how he jumped from a tree and sliced the boar's skull in two while half the adult males of the village stayed in the trees to watch and cheer him on. Share his many adventures in India with tiger, elephant, and leopard, and see how a fortuitous championing of a member of the ruling elite of Nepal during a bar brawl prompted Peter to move to Nepal and become a professional hunter there. Move with him to Nepal where he was, for years, the only authorized professional hunter to operate in that country. In the unspoiled wilderness of the White Grass Plains area of Nepal, where there were virtually no roads and the natives did not even know the name of the capital of the country, he hunted tiger right up till the close of tiger hunting in 1969. Follow his exploits in the Terai (forested southlands of Nepal) where he encountered a man-eater . . . that was eventually killed by a train! 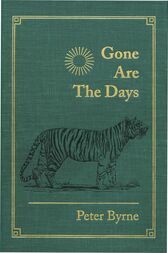 This is the true-life story about a time that now is completely gone--a time when virtually no cars were seen in the remote areas of India and Nepal, a time when tiger, gaur, leopard, sambar, and many other jungle denizens were plentiful beyond description. Those days are truly gone. Foreword by Charlton Heston. Peter Byrne still hunts, but now, like many professional hunters from days gone by, with a camera only. At the same time he is not antihunting, being well aware of the enormous revenues provided by properly organized and licensed hunting, one prime example of which is the 54,000-square-mile Selous, in Tanzania, a magnificent game park supported solely by hunters' license fees. When he is not operating conservation projects in the forests of southwestern Nepal, his home is in the Brentwood area of west Los Angeles, where he lives with his partner of more than a decade, Cathy Griffin.